Russia's lower house of parliament has passed a law allowing electronic voting in public elections - despite complaints that MPs' own electronic voting system was being abused. Communist Aleksei Kurinny said fewer than half the MPs who backed the bill were actually present to vote. Earlier, his colleague Sergei Ivanov said some MPs were abusing the system by voting on behalf of colleagues. Deputy Speaker Alexander Zhukov ignored the complaints. Mr Ivanov, an MP for the Liberal Democratic Party, appeared to cast doubt on the reliability of any electronic voting, based on his colleagues' behaviour in the State Duma. "I will not vote for this bill... There are 140 of you in this chamber, give or take one or two. If you are honest and decent people and don't vote for your colleague who is not occupying their seat next to you, the bill won't pass." Media reports say Mr Zhukov tried to make a joke of the plea, calling on MPs not in the chamber to take their seats. After the votes, Mr Kurinny reminded fellow MPs that voting on behalf of colleagues was not permitted and said he had counted only 152 in the chamber for the votes. Mr Zhukov again attempted to dismiss the complaint. 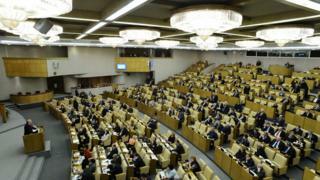 The three bills - on new forms of voting in elections - were passed by the Duma at their first reading. One of them was on the introduction of remote electronic voting in Moscow's city council elections on 8 September.